Which Horse Makes the Best Single? Unlike in 2016, when it seemed very difficult to come up with any logical singles for multi-race wagers (and only one favorite wound up prevailing), the 2017 Breeders' Cup offers a few races where bettors might feel confident using just one horse for multi-race wagers. The obvious standout is Bolt d'Oro, who figures to start as a heavy favorite in the Breeders' Cup Juvenile. The unbeaten son of Medaglia d'Oro is 3-for-3 so far and could not have been more impressive winning the FrontRunner Stakes (gr. I) at Santa Anita last month by 7 ¾ lengths, posting a final time that was mathematically good enough for a 113 Beyer speed figure (he officially received a 100). Even better, Bolt d'Oro is 2-for-2 at Del Mar, including a late-running win in the Del Mar Futurity (gr. I). If he runs back to his FrontRunner effort (or even close to it), he shouldn't lose this race. Other horses that figure to attract attention as possible singles are Unique Bella in the Filly & Mare Sprint and perhaps Lady Eli in the Filly & Mare Turf. Both will be relatively short prices in the wagering (Unique Bella in particular), but I personally would be hesitant to single either of them in these deep and competitive races. I'm actually more interested in the possibility of singling Drefong in the Sprint (gr. I) and/or Moonshine Memories in the Juvenile Fillies (gr. I), as both have looked great training for their respective Breeders' Cup races and Moonshine Memories seems clearly best of the California-based two-year-old fillies, having posted back-to-back wins in the Del Mar Debutante (gr. I) and Chandelier Stakes (gr. I). Good luck trying to find the winner in the Breeders' Cup Mile! Perhaps the Woodbine Mile (gr. I) winner World Approval has finally found his niche as a miler, or perhaps Godolphin's multiple Group 1 winner Ribchester will prevail two weeks after running in the Queen Elizabeth Stakes (Eng-I) over soft turf at Ascot, but outside of these two just about anything could happen. French horses have done well in the Breeders' Cup Mile over the years, and I actually have a bit of interest in the French-bred Zelzal. The son of Sea the Stars went 4-for-6 as a three-year-old in 2016, earning a solid 122 Racing Post Rating when winning the Group 1 Prix Jean Prat at Chantilly. 2017 hasn't been nearly as productive, but Zelzal caught soft courses in two of his three runs (both Group 1 events) and finished a good second behind the talented Taareef in the Group 3 Prix Bertrand du Breuil Longines, his lone run this year over firmer ground. The firm course at Del Mar should be much more to Zelzal's liking, and even in the Group 1 Sussex Stakes this summer over soft ground, Zelzal was beaten just 2 ½ lengths while fourth against a deep field that included Ribchester (2nd), Lightning Spear (3rd), and Lancaster Bomber (6th). Zelzal could well be 20-1 in the Breeders' Cup Mile, and at that price I think he's worth a look. Is U S Navy Flag Unstoppable in the Juvenile Turf? You can make a case that U S Navy Flag might be the best European two-year-old to ever compete in the Breeders' Cup Juvenile Turf. Trained by Aidan O'Brien, U S Navy Flag brings a three-race win streak into the Juvenile Turf, including wins in the Juddmonte Middle Park Stakes (Eng-I) and the Darley Dewhurst Stakes (Eng-I), the latter by a decisive 2 ½ lengths. Speaking strictly in terms of established form, U S Navy Flag is by far the most accomplished horse in the Juvenile Turf field and will surely be favored to win if he runs (he's also cross-entered in the Juvenile on dirt). Then again, it's worth noting that U S Navy Flag has never raced over a course with any meaningful turns, so it's hard to say how he'll handle the two tight turns at Del Mar. In addition, U S Navy Flag prefers to race on or near the lead, which could prove problematic since the Juvenile Turf could quite possibly unfold at a pace much faster than he is accustomed to facing. Among the European shippers, I'm more interested in James Garfield, Masar, and Nelson, particularly Masar, who handled a pretty sharp right turn when winning the Group 3 Betbright Solario Stakes at Sandown Park two starts back. Last time out, he finished a close third going a mile over soft turf in the Group 1 Qatar Prix Jean-Luc Lagardere at Chantilly, and his overall form suggests he will be very competitive in this race. I also wouldn't count out Voting Control, a Chad Brown-trained son of Kitten's Joy that broke his maiden impressively at Belmont Park before finishing a close second in the Pilgrim Stakes (gr. III), rallying into a slow pace to fall a half-length short of victory. He should get a faster pace in the Juvenile Turf, and his odds should be in the double-digit range. How often do you get to play an up-and-coming Chad Brown turf horse at those odds? Can Champagne Room Win the Distaff? Few Breeders' Cup races this year will be as competitive as the Distaff, which has drawn a very deep field of nine fillies and mares led by the multiple Grade 1 winners Stellar Wind and Forever Unbridled. One filly that could get lost in the shuffle is Champagne Room, who upset last year's Breeders' Cup Juvenile Fillies (gr. I) at odds of 33-1. She benefited from a good trip in a slow race that day, but nevertheless defeated a quality field that included American Gal and Daddys Lil Darling. Champagne Room subsequently finished third behind Unique Bella and Mopotism in the Las Virgenes Stakes (gr. II) in February, after which she was sidelined with an ankle chip. However, she returned with a visually impressive victory in the Remington Park Oaks on September 24th, in which she easily defeated four rivals in gate-to-wire fashion while earning a career-best 92 Beyer speed figure. Obviously the Breeders' Cup Distaff will mark a huge step up in class, and Champagne Room has shown a slight tendency to be rank in some of her races, but with the benefit of a comeback race under her belt, I think there's a chance that Champagne Room can take a step forward in the Distaff. She's made a nice impression training for the Breeders' Cup, and if she draws outside and can work out an ideal pace-tracking trip, I don't think it's out of the question that she could factor once again at a very big price. Now it's your turn! What are your thoughts on the Breeders' Cup pre-entries? 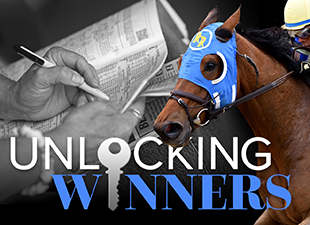 The Unlocking Winners Road to the Breeders' Cup Classic Handicapping Challenge is back for a third consecutive year! Please be sure to post all entries, prime horses, and stable additions on the official contest page. Thanks, and enjoy the racing!